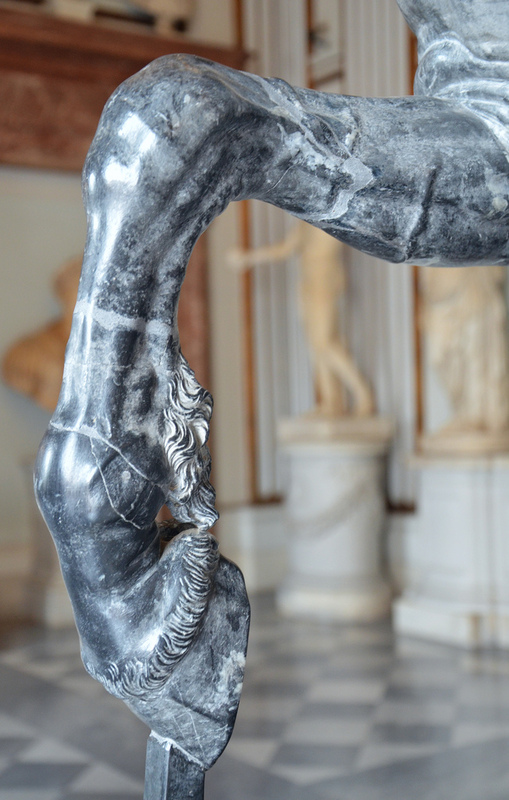 This month’s sculptures from Hadrian’s Villa are a pair of dark-grey marble statues of centaurs. The sculptures became very famous due to their sculptors’ outstanding workmanship and the rarity and high quality of their materials. The group was carved in bigio morato marble from the quarries of Göktepe near Aphrodisias in Caria (modern-day Turkey). 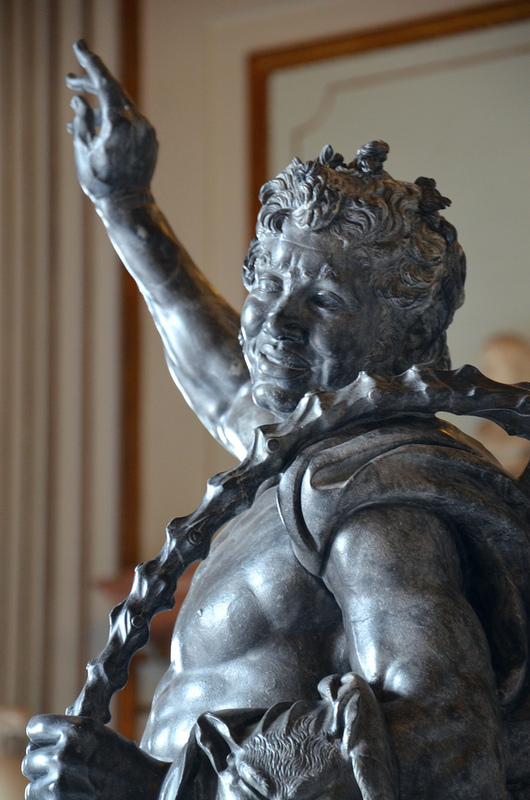 The statues are generally assumed to be a copy of a late 2nd century BC bronze Hellenistic original. 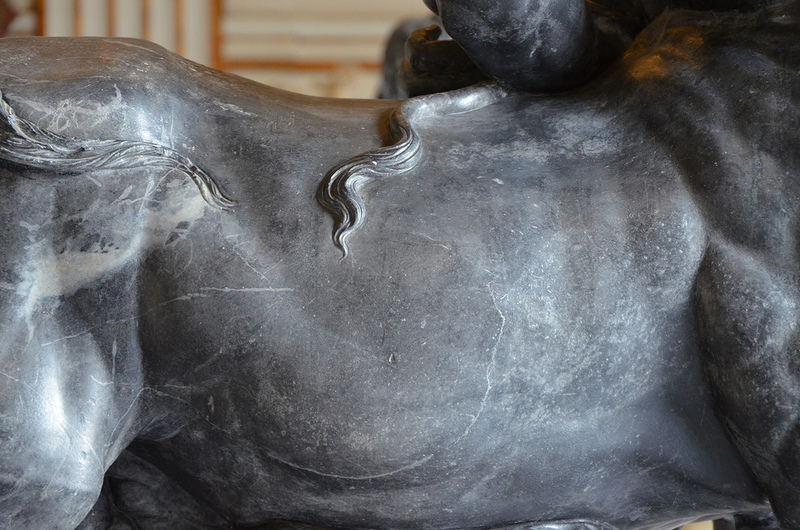 The Old Centaur, Hadrianic grey-black marble sculpture of a centaur based on Hellenistic models. 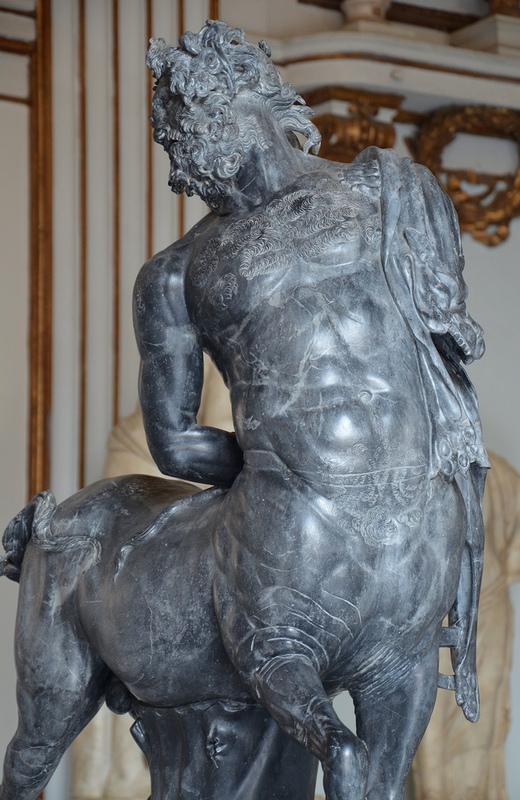 The Young Centaur, Hadrianic grey-black marble sculpture of a centaur based on Hellenistic models. 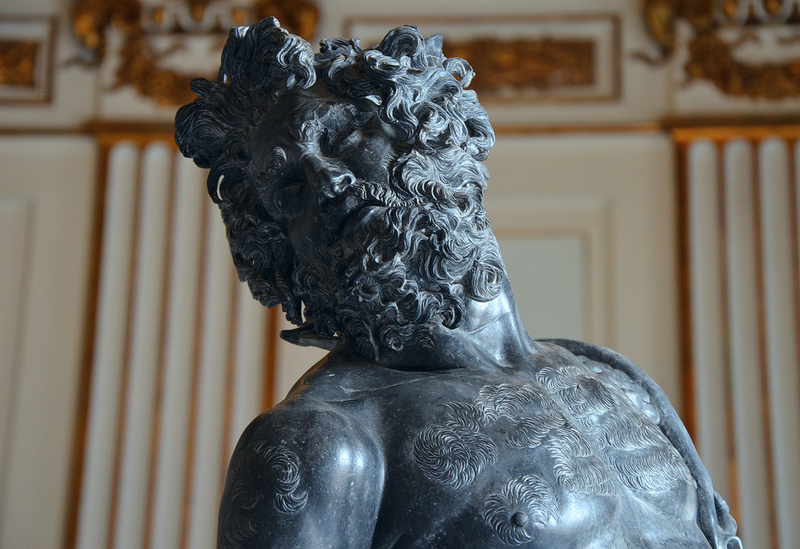 The sculptures were discovered in December 1736 during excavations in the Accademia carried by Cardinal Giuseppe Alessandro Furietti, an antiquarian and philologist. 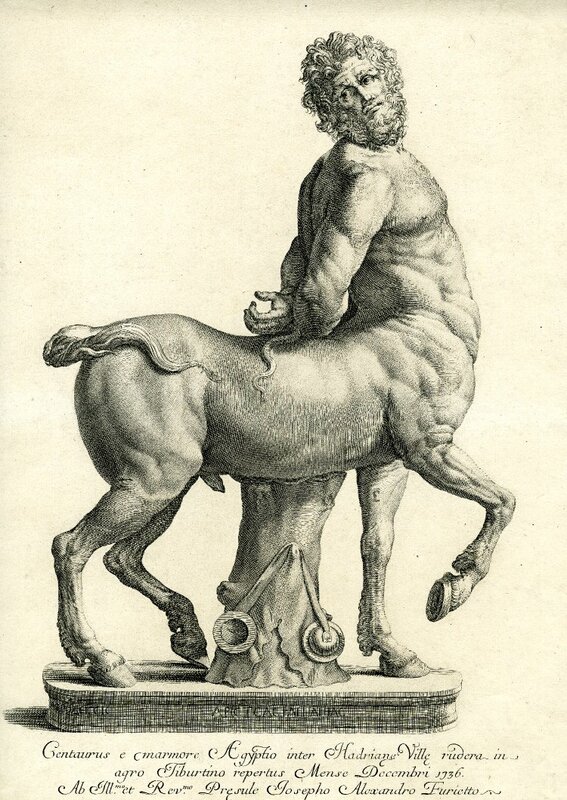 Only a few days after obtaining rights to excavate a section of Hadrian’s Villa, Furietti’s team unearthed the famous statues of Centaurs known today as the “Furietti Centaurs”. 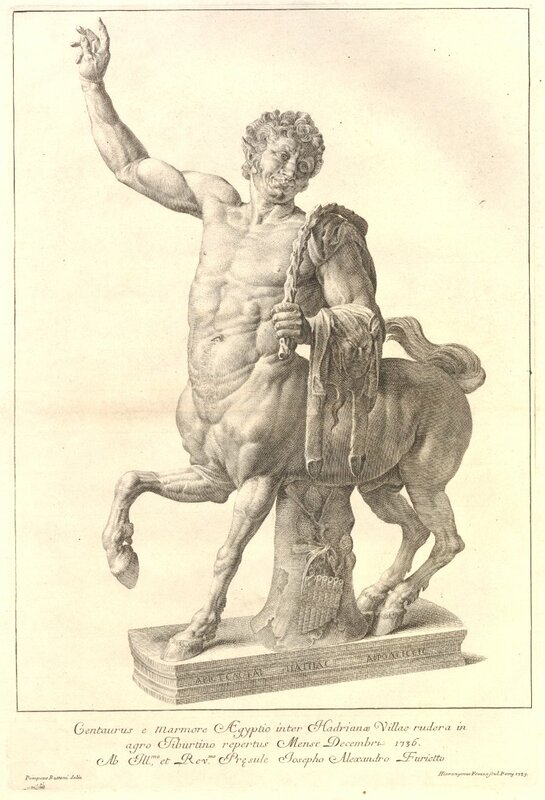 The two masterpieces quickly became two of the most celebrated sculptures in Rome, partly through two engravings made in 1738 and 1739 under Furietti’s supervision. The engravings are now part of the Prints and Drawings collection of the British Museum. Soon after their discovery, the sculptures were restored by the sculptor Carlo Antonio Napoleoni. They were displayed for some thirty years in Furietti’s apartments in the Palazzo Montecitorio in Rome until 1765 when Clemente XIII purchased them to be donated to the Capitoline Museum where they have been displayed in the main hall of the Palazzo Nuovo. 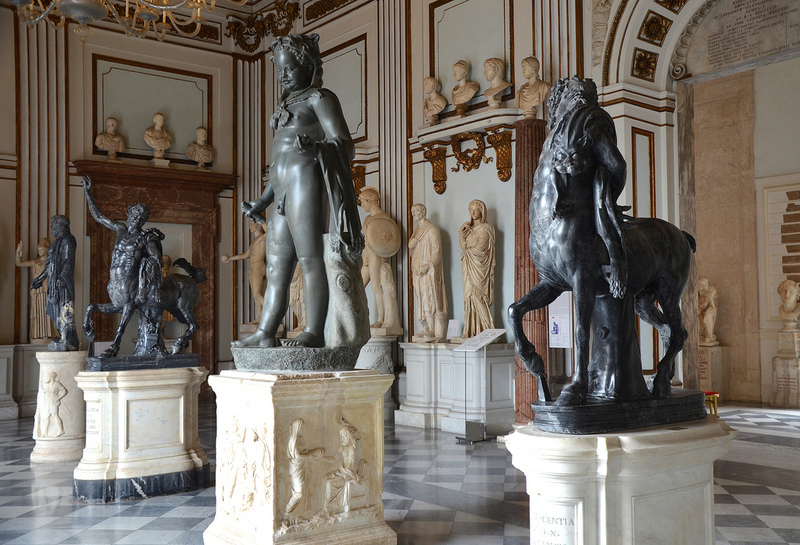 The Furietti Centaurs on display in Palazzo Nuovo of the Capitoline Museums. Among the other works of art unearthed at Hadrian’s Villa, Furietti found the celebrated Dove Mosaic, a high-quality work made in the opus vermiculatum technique and a copy of a lost ancient Greek mosaic from Pergamon. 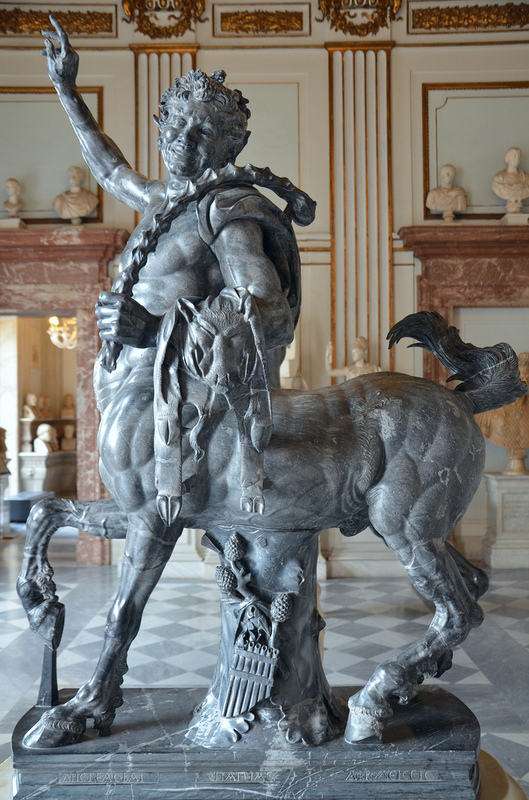 The Capitoline sculptures, probably commissioned by Hadrian himself, constitute copies of Hellenistic sculptures in bronze. These were created by Aristeas and Papias of Aphrodisias who may also have carved the so-called “Fauno rosso” (red faun). The sculptors’ signatures have survived and can be seen on the plinths of both sculptures. 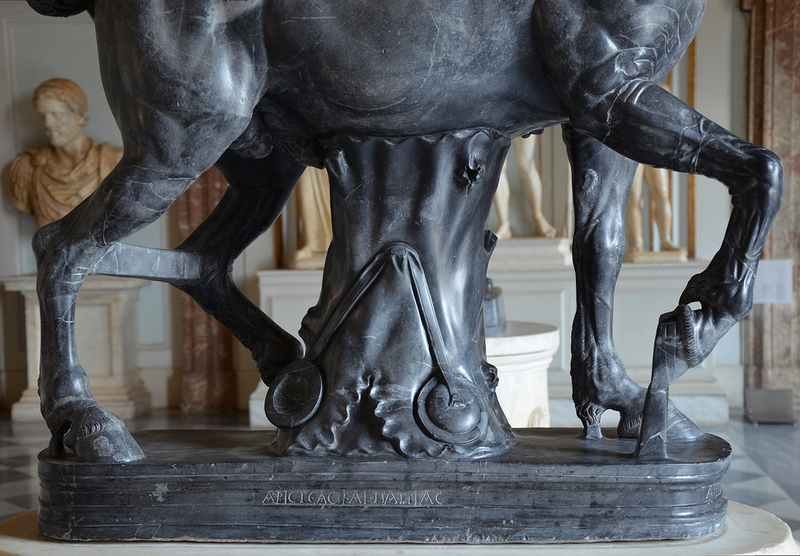 Plinth of the Old Centaur bearing the signature of the two Aphrodisian sculptors Aristeas and Papias (ΑΡΙΣΤΕΑΣ ΚΑΙ ΠΑΠΙΑΣ). The statues were carved in bigio morato marble from the quarries of Göktepe, located approximately 40 kilometres of the ancient city of Aphrodisias in Caria (modern-day Turkey), a city famous for its sculptural school which rose to prominence under Hadrian. The Göktepe quarries, discovered in 2006, produced high-quality, fine-grained white, as well as black, grey and bichrome marble. These different varieties of marbles were used mostly by Aphrodisian artists and became well established in Italy at the beginning of the 2nd century AD. The Göktepe marbles were among the most prized and widespread statuary marbles which formed part of the decorative programme of Hadrian’s Villa. 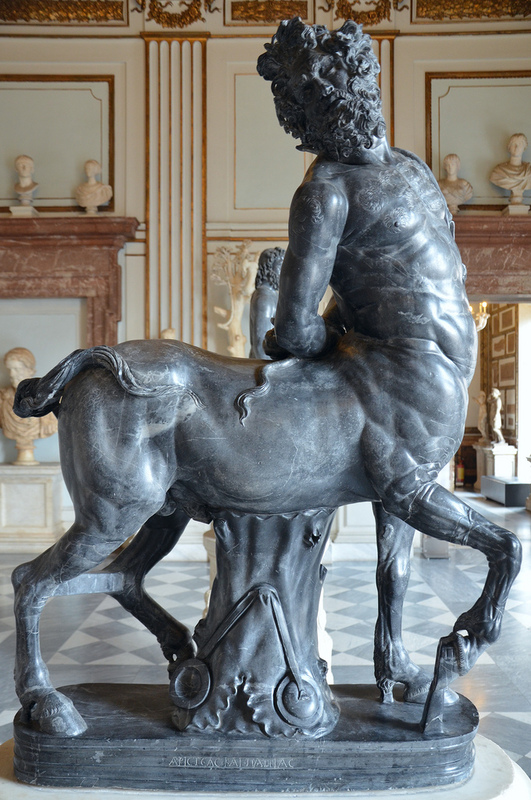 Statua di Centauro anziano Attanasio, Donato et al. “APHRODISIAN MARBLE FROM THE GÖKTEPE QUARRIES: THE LITTLE BARBARIANS, ROMAN COPIES FROM THE ATTALID DEDICATION IN ATHENS.” Papers of the British School at Rome, vol. 80, 2012, pp. 65–87. Previous postAnnum novum faustum felicem vobis! So, how often were sculptures like this actually painted? The trend these days seems to be that “everything was painted”, yet why then would certain colors of marble be prized if they were going to be painted over? Stunning and Interesting. Thanks Carole. Thank you so much for creating this blog. 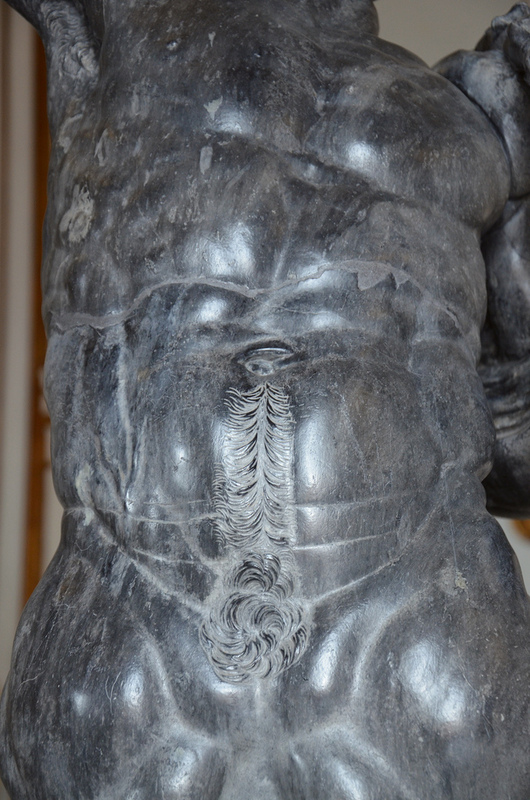 Just returning from a trip to Hadrian’s Villa and Villa d’Este and this is the third piece of the puzzle.